Running back Jordan Howard #24 of the Chicago Bears celebrates with head coach Matt Nagy after scoring a one yard touchdown in the second half of the NFL game against the Arizona Cardinals at State Farm Stadium on September 23, 2018 in Glendale, Arizona. 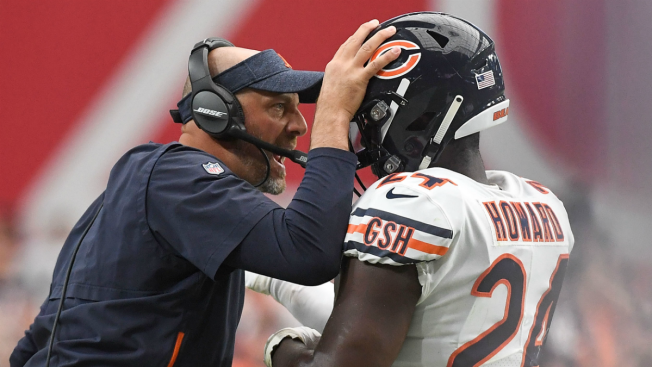 Coach Matt Nagy insisted Jordan Howard remains a big part of Chicago's offense and the star running back was adamant he wasn't frustrated despite a limited role in the most recent victory. "This is not going to be an offense where it's just one person and it goes through one person," Nagy said Monday. "I don't necessarily believe in that. It's great when you have everybody fulfilling different roles and it's hard for the defense when you do that." The Bears (3-1) own sole possession of the NFC North lead for the first time since late in the 2013 season, with three straight wins. Coming off a bye, they hope to keep rolling when they visit Miami on Sunday. Chicago matched its longest win streak since a 3-0 start in 2013 with a 48-10 romp over Tampa Bay two weeks ago. Mitchell Trubisky broke out with six touchdown passes — one shy of the NFL record. Tarik Cohen added a career-high 121 yards receiving to go with 53 rushing, and the Bears came away with their most lopsided victory in six years. As good as that sounds for Chicago, something else stood out: Howard's small role. He carried 11 times for 25 yards and was in on 33 of 61 plays. Howard didn't talk to reporters after that game, and players were not available to the media until Monday. "No, I wasn't frustrated," Howard said. "I was happy. We won. You see how much we won by. So there's not really nothing to complain about." With more than 2,600 yards rushing since the Bears took him in the fifth round in 2016, Howard has been one of general manager Ryan Pace's most successful draft picks. He ran for 1,122 yards last season after finishing second in the NFL with 1,313 as a rookie. But there were also questions how he would fit in Nagy's system after struggling in the passing game his first two seasons. Howard's name came up in offseason trade rumors, and Bears-related photos disappeared from his Instagram account at one point, though he insisted there was nothing to it and wouldn't acknowledge removing the pictures. Howard has shown improvement catching the ball but hasn't found a rhythm running it. With 203 yards on 64 attempts, he is averaging 3.2 per attempt. That's well below his career average of 4.5 yards. Howard has run the ball 15 times or less in three of the four games and hasn't rushed for more than 82 yards this season. "Jordan understands what we're trying to do as a team," Nagy said. "And he also understands, and we've talked, that he has a major part of this offense. He has a big-time role. But if it's an advantage to us to go a different direction for that game or for that play or that series, we're going to do that." It's hard to argue with what the Bears did against Tampa Bay. They saw an opening against a banged-up secondary and got huge games from Trubisky and Cohen, even if it meant a light day for Howard. "The majority of the games, he gets more workload than I do," Cohen said. "He understands some games are different. We felt like their secondary was banged-up, so that's what happened, we're gonna attack them." That's something they probably couldn't have done last season. But the Bears brought in more play-making pass catchers and hired an offense-minded coach after firing John Fox. They have more options now and don't necessarily need to rely on the run as much. "If we want to put him in the game and use him for a certain advantage, we'll do that and that could be first, second or third down," Nagy said. "There's other times where it doesn't fit that way. It just so happened this past game that ... Tarik got more plays in regards to getting the ball to him, and he was productive. But that has nothing to do with what Jordan Howard is doing. Jordan Howard is a big part of this offense." NOTES: WR Anthony Miller (shoulder) and CB Prince Amukamara (hamstring) did light work at practice. Both players sat out the Tampa Bay game. ... The Bears placed LB Sam Acho (torn pectoral muscle) on injured reserve and signed OL Bryan Witzmann.